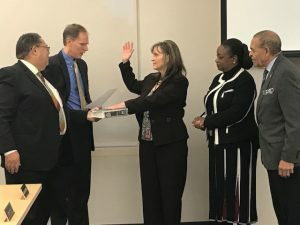 Deborah Lawson, a licensed clinical social worker and family therapist, at the Center’s Wake STEP Clinic in Raleigh, was appointed to the Wake County Human Services Board in November and approved by the Wake County Board of County Commissioners for a two-year term. Wake County Human Services Board is a consolidated policy and advocacy board for the Human Services and Environmental Services Departments. Lawson was administered the oath at the November 15 board meeting and replaces Ronda Bean as the social worker on the Board.